A report just published by consultancy Rewheel compares pricing of benchmark mobile tariffs across the EU and beyond. The good news is that Rewheel categorise Ireland as one of the more competitive markets. The bad news is their find of Ireland as ‘the most expensive of the competitive markets’. Mobile telcos worldwide are facing the threat of losing revenue to so-called over-the top services (like WhatsApp, Viber, and the granddaddy of them all, Skype). The battle for superior functionality in traditional telco products is all but lost (MMS, anyone?) and attempts to compete by launching services like Joyn are struggling to gain traction. 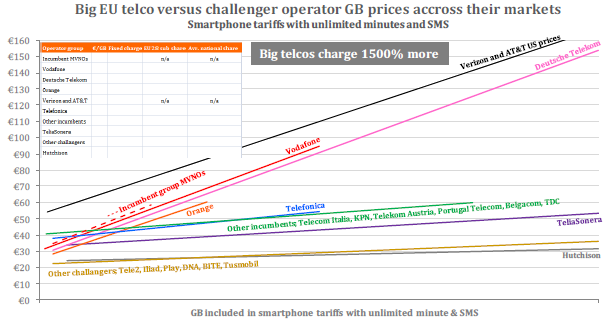 Many telcos have turned to tariffs to try stop the slide towards becoming a dumb pipe: the development of price plans offering unlimited voice and SMS, but charging heavily for data access has become almost ubiquitous across the OECD. Many of these tariff plans can be shared across families, thereby increasing the lock-in that we see when entire family is on the same network. And because these plans are so similar to each other, they can be directly compared. This month sees an interesting report from mobile data consultants Rewheel entitled ‘Price benchmark of smartphone tariffs with unlimited minutes & SMSs in EU28, US, Switzerland and Norway – October 2013’. The ‘executive preview’ (a teasing selection of the findings) is available to download here. The report describes mobile internet (at the risk of hyperbole) as ‘the fuel of digital economies’ and finds that pricing for these bundles in Europe’s ‘protected oligopolies’ (e.g. Germany, Spain, Greece and Hungary) is up to 2200% higher than the the EU’s most competitive markets (UK, Sweden, Finland, Denmark & Austria). It also finds that big EU telcos tend to charge more. No surprise: there is no point investing millions in a multinational brand if you can’t leverage it by charging a premium for services. And where does Ireland fit into this picture? The report says “Ireland ranks as the most expensive competitive market (i.e. markets where a challenger like Hutchison is present). 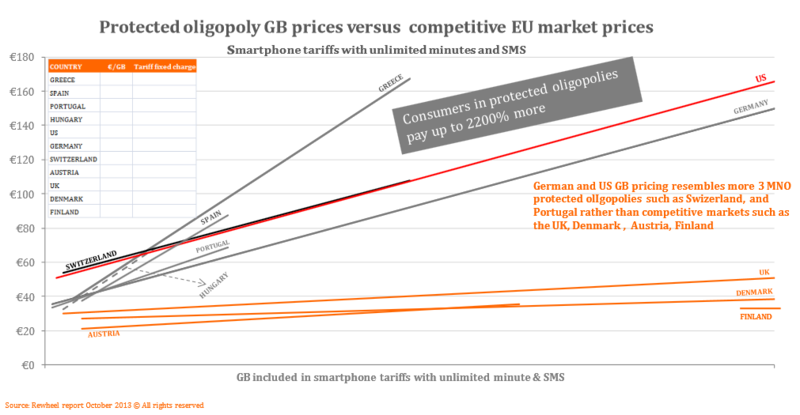 The price for a 2GB smartphone tariff with unlimited minutes and SMS is €35 which is slightly above the EU28 average.” The graph below shows that Ireland shares this honour with another unnamed country. This analysis tallies broadly with Comreg’s figures in the figures as described in their latest quarterly market report: pp. 65-69 of the report shows low-spending & prepaid Irish users paying rather more than average, and medium and high users paying the average price or a little less. So what of the future? With the recent purchase of O2 Ireland by Three, Ireland’s market is hardly going to become more competitive anytime soon. Perhaps this consolidation will move Ireland from its position as the most expensive of the competitive economies to being one of the cheaper of the protected oligopolies! The full report is available for purchase from Rewheel for €3000. This entry was posted in Mobile telecoms and tagged Mobile data, pricing on October 21, 2013 by Simon Rees. 5G for Ireland – what, when, who, where, why? Why do people choose prepaid mobile? The end of the telco as we know it? Paudie Walsh on Why do people choose prepaid mobile? Paul Clan on The end of the telco as we know it? Simon Rees on The end of the telco as we know it?